Across the nation, stories are being told where voters are suddenly finding themselves purged from the rolls. It isn't a secret that Republicans want to make it as difficult as possible for some people to vote. Here in Missouri, names being dropped hasn't been a problem yet but we may not know til August. What we do know is that this may be the first election for a large number of people under the new Voter ID laws which went into effect last year. Take a moment today or tomorrow and do two things. First, check with your local election authority that you are still registered as a voter and your address is current. Kansas City Election Board is HERE, Jackson County (outside of KC proper) is HERE. You can also check with the Secretary of State's office HERE. Second, make sure you are well read on the new voter ID laws so, when you have friends and neighbors who may be confused, you can direct them to the right place or have a good answer. In almost all cases, using any government ID will be fine OR presenting a voter registration card, student ID, utility bill or bank statement AND signing a statement acknowledging you are now aware of the new laws will allow you to vote immediately. Visit the Secretary of State's site to get the official language and forms of ID. 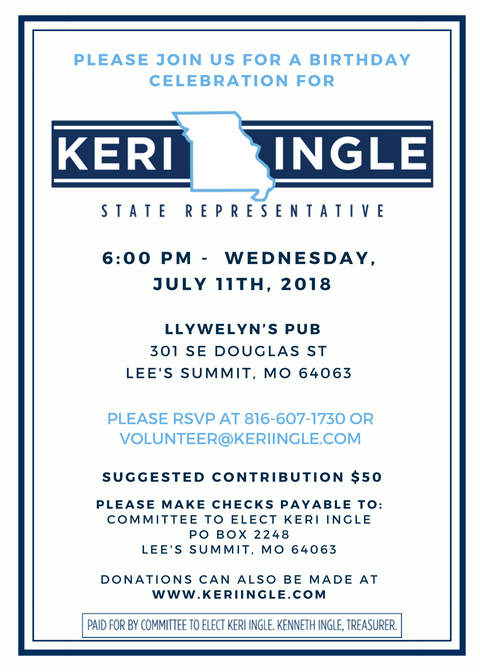 By now, you have seen mailers and video ads on both sides regarding Proposition A which is on the August ballot in Missouri. 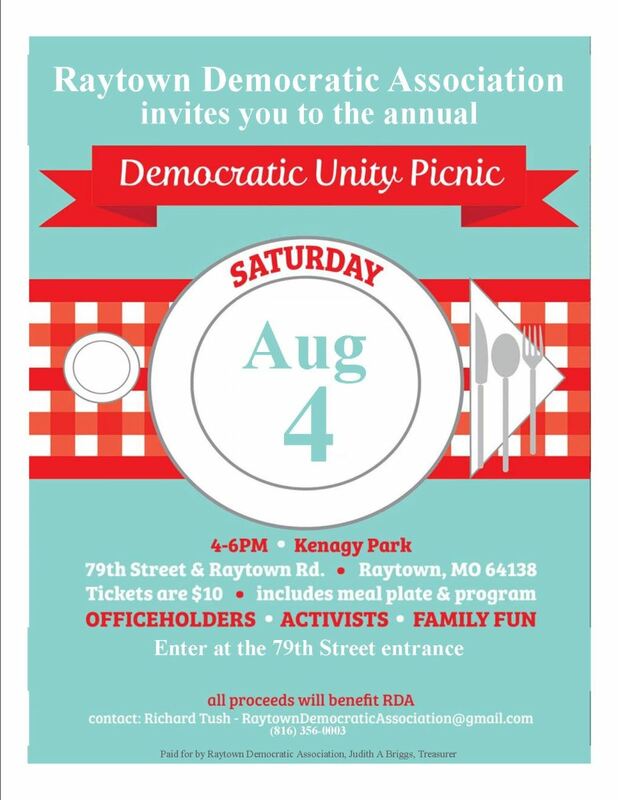 Since the petitions were first circulated, the Missouri Democratic Party has been firmly supporting the VOTE NO ON A campaign. Voting NO is how all citizens can say that Right to Work, which drives down wages and increases risks on worksites, is wrong for Missouri. Anti-union forces have made this law and attacking the working families of our state a multi-million dollar priority for several years, and this vote is our last chance to stop it. Have a yard sign yet? Come to our office to get your Vote No on Prop A sign before we run out again! Gov. Mike Parson on June 29 signed into law the various appropriations bills that make up the $28.6 billion state operating budget for the 2019 fiscal year. Parson also exercised his veto power for the first line by issuing 21 line-item vetoes to trim nearly $12.1 million in spending authority that lawmakers had approved. Major spending items Parson deleted from the FY 2019 budget, which began July 1, included $3.77 million for biodiesel subsidies, a $1 million funding bump for Missouri Southern University in Joplin, $1 million for emergency bridge repairs, $1 million for workers’ compensation grants for volunteer fire departments and $750,000 in additional funding for Harris Stowe University in St. Louis. Parson also vetoed $1 million to buyout homes in north St. Louis County that have radioactive contamination from the nearby West Lake Landfill. In his veto messages, Parson broke with tradition by not explaining his reasons for his budget actions. With a $99 million increase for the statutory formula for distributing state funding to local public school districts, the state can claim to have fully funded basic K-12 education for the second straight year. However, full funding was achieved only after Republican leaders rewrote the funding formula in 2016 to reduce its cost by more than $400 million. The claim of full-funding is further undercut by the fact that student transportation costs remain underfunded by nearly $200 million from what state law requires. The budget also makes permanent a $36 million cut to higher education funding that previous Gov. Eric Greitens unilaterally imposed at the start of FY 2018. However, lawmakers refused to go along with Greitens’ plan to slash an additional $68 million from public colleges and universities for FY 2019. Senator McCaskill and the Democratic Party's coordinated campaign offices in Kansas City, Independence and Lee's Summit are open but need supplies. All campaign offices run on very tight budgets, so they rely on donors for a little extra help. At least one office needs tables and folding chairs. Others can always take printer paper and other office supplies. Contact us to find out what you can send where. Every bit counts! 40 Club Lunch: July 10th, noon at Sheet Metal Local 2 (2902 Blue Ridge Blvd). Celebration of life for Bill Richardson. All are welcome to bring good stories about your time with Bill and share. 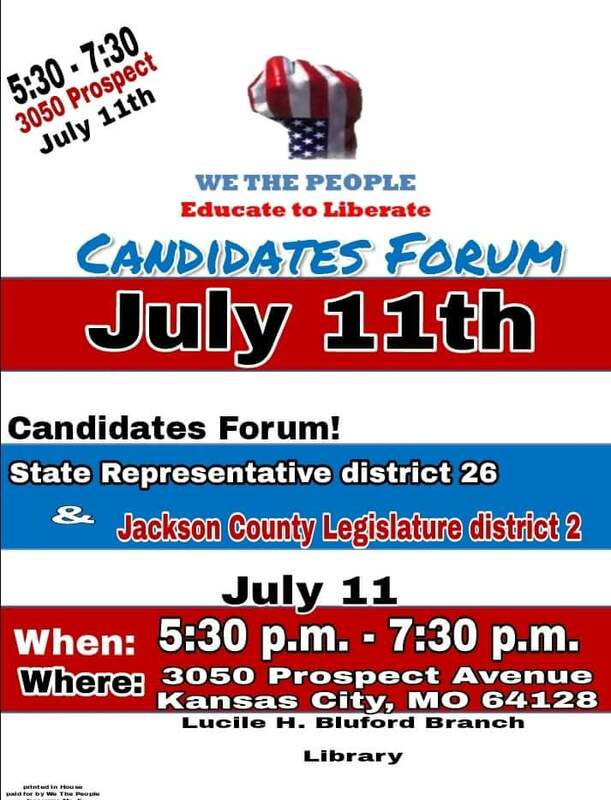 Senate District 8 Candidate Forum: Thursday July 12, 6-8pm. John Knox Village in the Courtyard Community Center at 518 Murray Road. The Courtyard Community Center is located on the west side of Murray Road on the John Knox Village Campus. Sponsored by League of Women Voters. 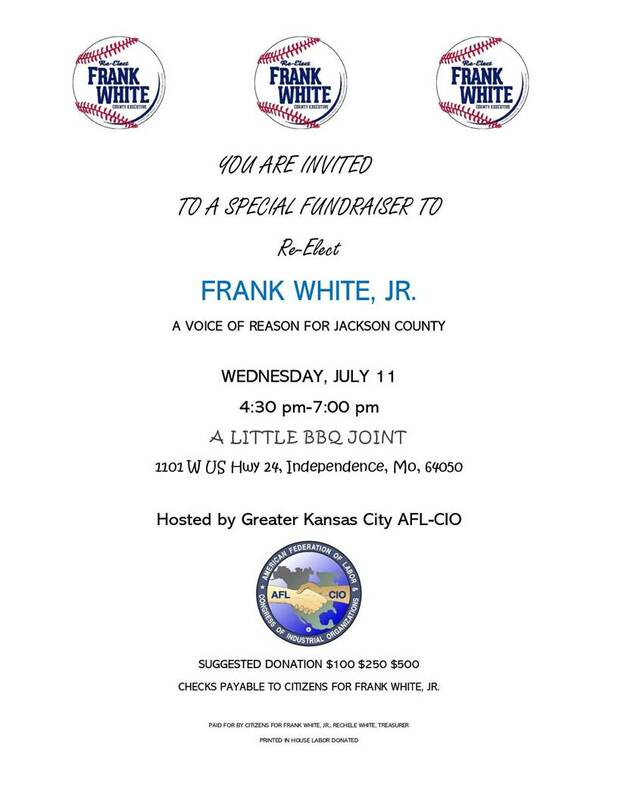 Southland Progress: fundraiser and endorsement announcement. 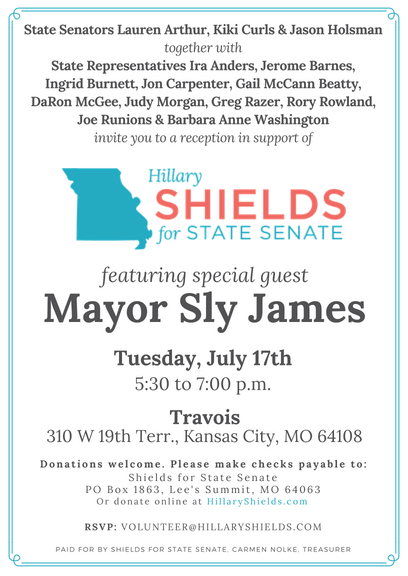 Thursday, July 19th, 5:00-7:30pm at Southside Bar and Grille (1144 W 103rd St. KCMO). 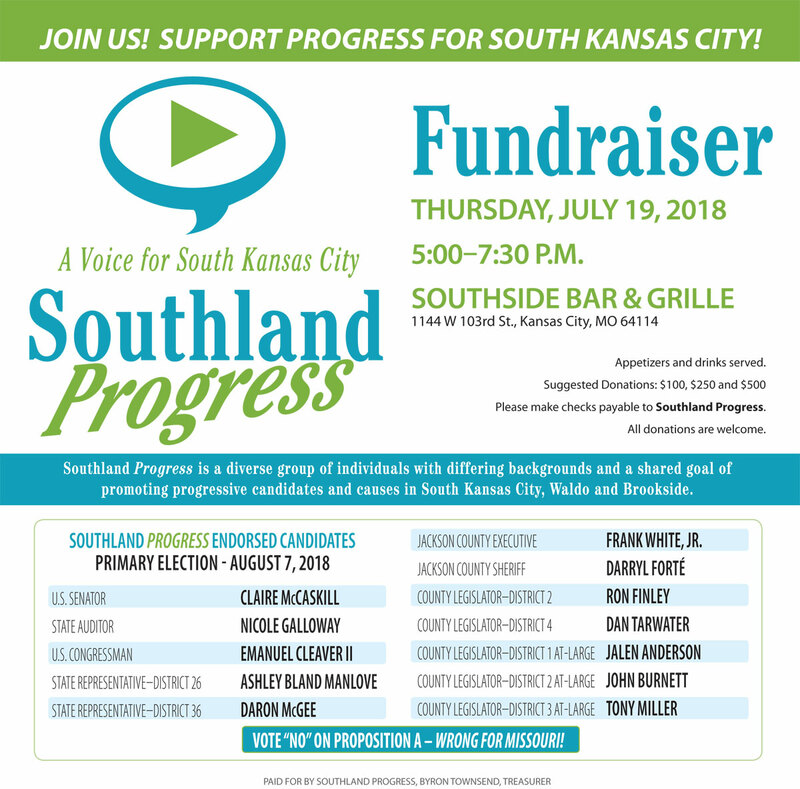 Southland Progress is a diverse group of individuals promoting candidates and causes in South KC, Waldo and Brookside. 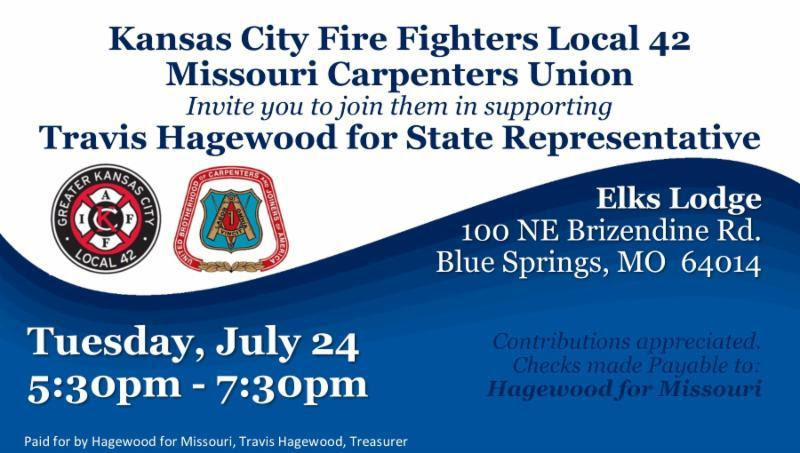 Heartland Alliance for Progress: Monthly meeting Monday, July 23rd, 5:15pm-7:00pm at Californo's (4124 Pennsylvania KCMO). Special guest, Jason Kander who will be speaking about his work with Let America Vote. 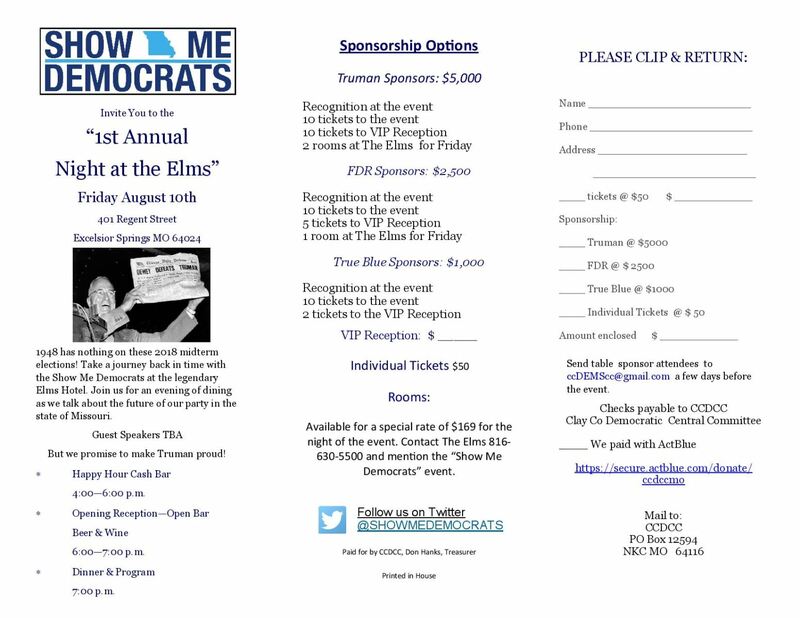 Clay County Democrats First Annual Night at the Elms: August 10th at the historic Elms Hotel in Excelsior Springs. Join for dinner, remarks from officials and candidates, and discussion about the 2018 midterm elections. See below for ticket information. Special group rate for the night. Scroll down for more upcoming events!